Maybe you’ve heard: Legislation just proposed in Arkansas would ban books by or about Howard Zinn from all public schools in the state. The bill, submitted by Representative Kim Hendren (R), can be read in full here. In solidarity with Arkansas educators and students, the Zinn Education Project will send a book by Howard Zinn and A People’s History for the Classroom to any Arkansas teacher who requests them. This offer is made possible by donations from individuals and from publishers, including Haymarket Books, Seven Stories Press, The New Press, Beacon Press, and HarperCollins. Already, 700 middle and high school teachers and school librarians have sent requests and more continue to come in. There has been widespread national news coverage of the story, including on WBUR, Melville House, Boston Magazine, Common Dreams, and more. Please join us. We need your help so that we can respond to every request for these materials. Now, more than ever, students in Arkansas—and across the country—need a chance to learn the true history of the United States, a people’s history. Please help ensure that all Arkansas teachers receive a book by Howard Zinn and A People’s History for the Classroom. If you want informed citizens who question and think critically, help us send people’s history teaching resources to classrooms in Arkansas. 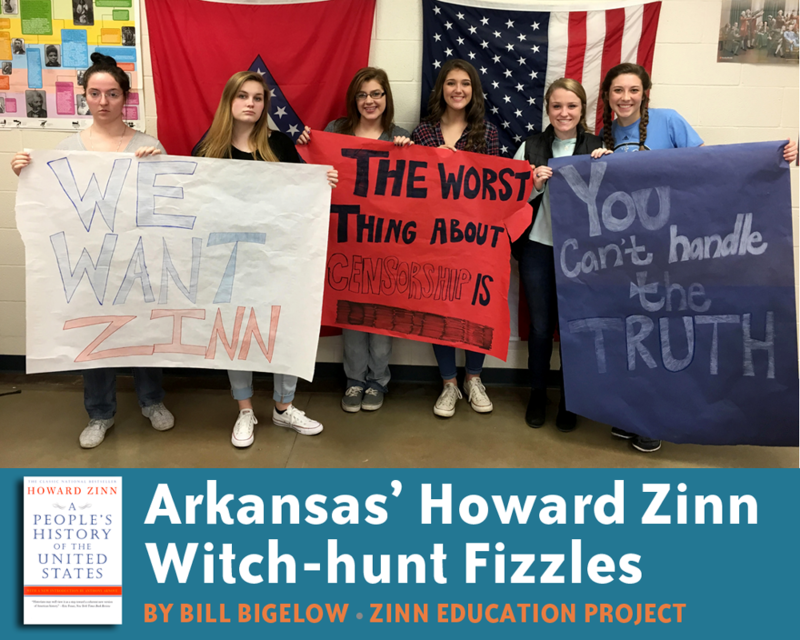 Stand with the Zinn Education Project to defend the right of teachers in Arkansas and everywhere to use materials by and about Howard Zinn. Join us with your donation today.